This photograph has been scaled down; full resolution photograph is available here (800 by 570 pixels). KEEP CLOSE TO YOUR TIGER: Looks like the Russians have abandoned a few 76.2mm field guns. 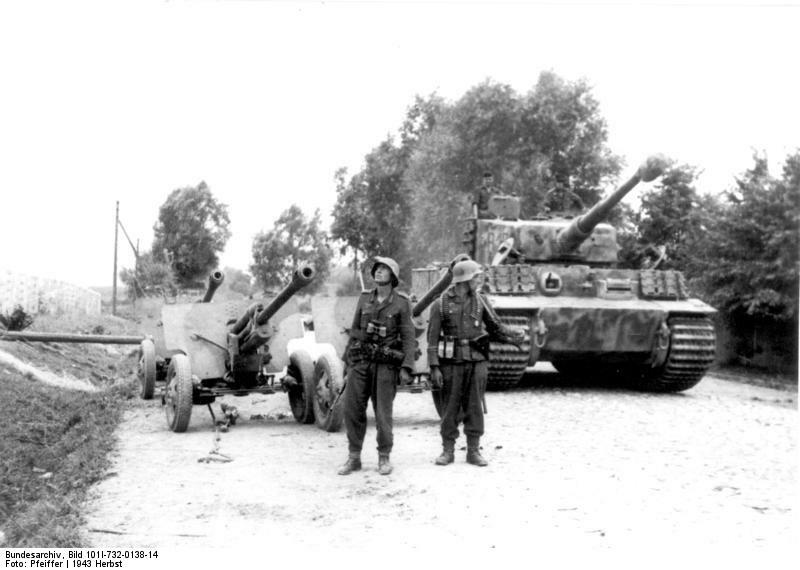 The Germans captured thousands of them along with captured armored vehicles and modified them into self-propelled guns. Some guns were supplied to the Afrika Korps. The Germans liked the 76.2mm guns for their reliability, durability, and accuracy they found out, it could knock-out light and medium tanks with its armor-piercing round but, against the Tiger and Panther it made the lives hard for the Russian gun crews. LOOKUP IS IT A BIRD, NO ITS OUR STUKAS: The troops could be looking at the Stuks taking out targets ahead of them. The troop (soldier) on the right looks like he could be a Scutze (Private) carrying a MG34 w/link belted ammo around his neck, armed with a walther P-38 or Luger 08 pistol in his holster. The other soldier looks like he is a Gefreiter (Lance Corporal or Obergefreiter Corporal) because he's got the field glasses around his neck, sidearm same as the private walther P-38, or Luger 08 Pistol, looks like he's armed with a MP-40 9mm Sub-machine gun, but this is my guess. The Tiger behind them, is there for comfort Don't leave home without it.